Can the days and weeks go by any faster? I don't think so. Before you know it fall will be here and summer is really just getting started. Anywho, there were lots of awesome links last week and here are just a few. Adventures in Decorating. And I want their view! Had a couple of industrial cart entries. This one was a DIY project. Can you believe it? You must see how it was built by The Blissful Bee. This one was purchased for only $20. Yep, you read that right. Visit Salmagundi to read the story. We have all seen the Union Jack dressers well how about a Betsy Ross inspired dresser? Check this out at The House at Bluebird Lane. You can find out how to make this cute octopus bag with free printable at The Creativity Exchange. Karah of The Space Between shares this wonderful pallet bed that she built on her roof. Makes me want to take a nap. I have never heard of this dessert before, but it sure looks good. You can find the recipe for banofee at Pine Cones and Acorns. Thanks so much to everyone who joins this party each week. Wouldn't be a party without you. Now I want to see what you have to share with us this week. Also, today(6-5) is the last day to get the 15% discount at my sponsor's site Ann Sutton Designs. Just use the code SAVVY15 when you check out. She truly appreciates all the sales she had this week. Last number she told me was twelve. Y'all are awesome! 1. Please have a link to this party in the post or add my party button from the sidebar. Kim, your features are amazing! Each one is so different and so inspiring. Thank you for hosting another great link party; it's always fun! Great features, Kim. 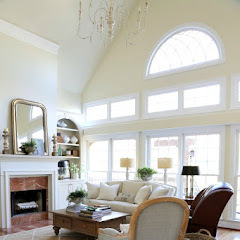 I saw the reveal of the sunroom that Becca did for her parents - beautiful. Now I'm off to check out the others. Thanks for hosting! Thank you so much Kim for hosting every week girl and thank you SOOO much for featuring my octopus beach bag! I'm thrilled to be included with these fabulous features! I'm off too to go see everyone's projects this week! Beautiful features, Kim! Off to check out Becca's sun room. Thank you for hosting. Thanks for hosting. Those carts are awesome. Can't wait to visit your features. It's finally summer here in Minnesota, Kim, hope it doesn't go by too fast! Thanks for hosting! PS...I know which lamp you bought! I have been eyeing it at the Queen for months...gorgeous! Kim, what great features! Love those industrial carts!! Hey Kim- glad to be hanging out with you and all of these fabulous projects this week. Great party Kim! Love all the wonderful features. Such good ideas! Always love your party Kim. Thanks for hosting! Thank you for all the referrals I receive from your party. You are a great hostess. wow, so much great stuff, love the pallet bed and the desert, well I love it all! Happy JUNE, Kim! Thanks for hosting. Beautiful features this week. I have to check out that pallet bed! I have a roof! LOL! Thanks once again Kim! 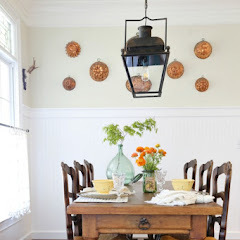 Fab features - from Becca's parents sunroom to the flag dresser! But my favorite has to be that pallet bed - the view alone is worth it! You have so many talented readers. Love looking through all of them. Great features Kim, thanks for hosting. 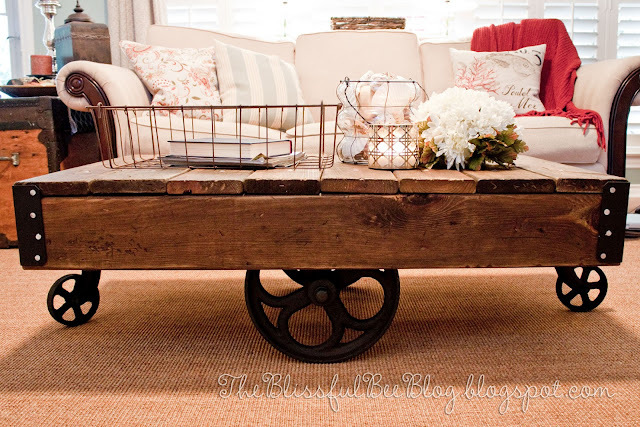 Hey Kim, just linked up, LOVE that industrial cart! thanks for being a great hostess!! Love the industrial cart. Thanks for hosting! I love the pallet bed, I could use a nice drink then a nap up there! you are so wright time is just flying by already June 5th can't believe it . And thank you so much for hosting a truly wonderful linky party! Thank you for hosting again. I am going to check out some of the links that caught my eye as I was linking up! The party is filling up fast, and this bunch has some serious creativity going on! Thank you so much for having the party for us, Kim. Thanks for hosting, Kim. 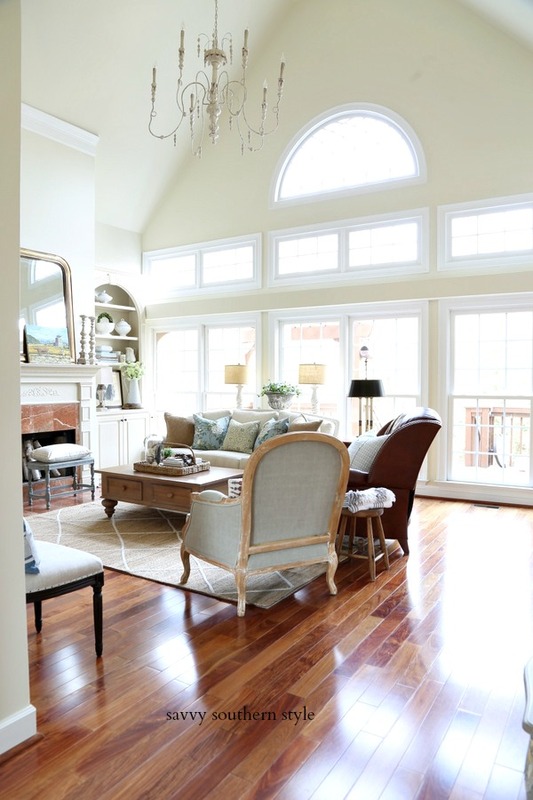 i love the features, especially the sun room! I could live there. Thanks so much for the shout out!! Can't wait to link up this week! Hi Kim! Thanks for hosting this each week ~ I've just linked up again. I am sooo loving the industrial carts you featured!! Getting ready for my WEDDING BLOG PARTY on Friday and would really love it if you could join us ~ there will be a giveaway, too! I love the furniture that you have featured for the week. I also seen nice furniture in one of the sites here. Want to check this out? Just click here. Thank you, thank you so much for the feature, Kim. What an honor!! I always look forward to your party every week. Thank you so much for hosting!! 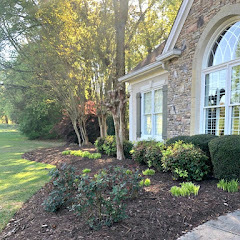 Such a great roundup of projects, Kim! Thanks, as always, for hosting! Thanks for hosting this week, Kim! Don't you just love those industrial carts?? Awesome!! Great features, Kim. It's always a pleasure to visit the posts linked to this party. Thanks! Wonderful features this week Kim! So glad to be partying with you! Great features, Kim. Thanks for hosting each week. Fabulous features Kim. Especially loving the dresser. Thanks for having all of us to your party...one of the best for sure! 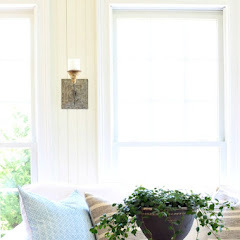 Thank you so very much for featuring my parents's sunroom ... truly flattered and appreciative! 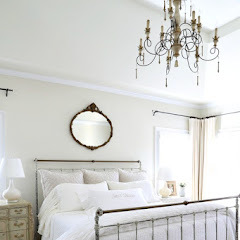 And, I love the other features ... the cart, the pallet bed, the painted dresser ... amazing! Beautiful features, Kim. Love that dresser. Thanks for hosting. I'm really excited about my link this week. Thanks for hosting! 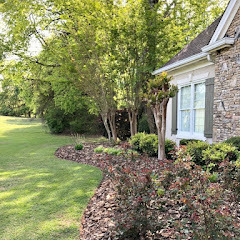 I swooned over the outdoor bedroom! Yes, please! Thank you so much for the wonderful party! I really like the flag dresser that you featured. Perfect for my upstairs rec room! Thanks so much for hosting again this week. Thanks so much for hosting! I feel like I was just linking up here and another week has flown by! Why does it always go so fast in the summer? Thanks so much for hosting, Kim! Have an awesome week! Bummed out! I tried to link up but your linky party tool wouldn't let me, even though I linked back to you in my post. Great stuff, love that flag furniture piece, finally back into partying..it's been so long! Thanks for hosting! Thanks so much for hosting, Kim! It's always a great party. Your parties are always SO amazing! We have those industrial carts down at our store. I LOVE them! Thanks for hosting WOW! I'm off to check out that dessert! Thank you so much for always hosting a great party! I always find so many inspiring posts in the party and from you. Thank you also for featuring me! 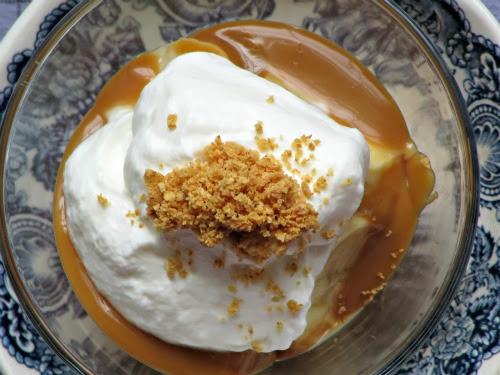 I hope that some of you will try the banoffee, it is great as a pie or in single servings! Wow...so many fun things going on here. It seems people with the best projects party here!!! I LOVED the crate bed, I remember reading it on my cell last week, lol! I have to read it again om a decent screen! Thank you so much for hosting!! And Yes, I feel time is flying, too! Hi Kim~ awesome features!!! Thanks for hosting! That dessert does look fabulous! Thanks for drwaing my attention to it-LOVE that rooftop bed too! Thanks for hosting! Thank you very much for hosting, Kim! I love your blog an I'm very happy joining the party! Thanks for hosting Kim. I could spend days looking at all the beautiful creations. The ♥ everyone of the featured items. Amazing! Thank you so much for hosting. 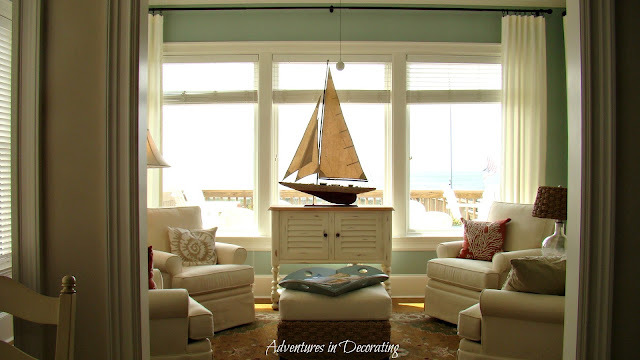 I love the sailboat in the sun room! Just gorgeous! Beautiful features - thanks so much for hosting! Hope you have a great weekend. Have a lovely weekend ahead..